Tony Grajeda, left, and Lila Herod, right, pose with their "bridge" Stephanie Beckett. Grajeda and Herod were each diagnosed with cancer in October 2011 and were able to find comfort in their experiences through Beckett, who is Grajeda's daughter and Herod's employee. The world is a small place, or at least sometimes it feels that way. And although the phrase is most often reserved for chance encounters far from home or the discovery of mutual friends, colleagues and acquaintances, it also can be a small world for those facing similar illnesses at almost the exact same time. 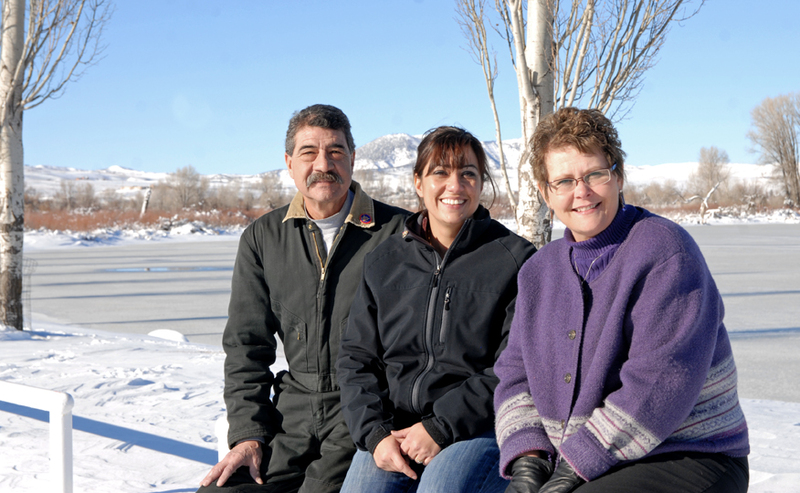 In October 2011 Craig residents Lila Herod and Tony Grajeda were diagnosed with cancer about a week apart. Not only were Herod and Grajeda diagnosed in the same month, they also underwent treatment at about the same time and had their respective surgeries two days apart at University of Colorado Hospital in Aurora. Though Herod and Grajeda were undergoing treatment for similar illnesses, it affected them in different ways. For example Herod was diagnosed with breast cancer, which is notoriously difficult on the body, especially while undergoing chemotherapy and radiation treatment. Grajeda, on the other hand, responded well to chemotherapy and radiation, but struggled in the weeks and months after his Esophagogastrectomy surgery. An Esophagogastrectomy in English is a gastric pull through and the primary procedure for people with Esophageal cancer. Grajeda’s cancer was located in the bottom portion of his Esophagus and the top portion of his stomach. Doctors removed nearly 80 percent of his digestive system and compensated for the loss by stretching out what remained of his stomach. Essentially Grajeda no longer has a “bowl” and food embarks on a straight shot to his colon. The procedure is not only complicated, it’s one most people don’t survive. Though Grajeda and Herod both admit they didn’t interact much during their respective treatments, they received some comfort through a mutual connection, Stephanie Beckett. Beckett is Grajeda’s daughter and one of Herod’s employees. “She was kind of that bridge of information for both families,” Shamra added. Though Beckett thinks having that connection between her father and her boss helped her deal with what they were both going through, Herod said Beckett helped her relate to her family better. So often people get caught up in the illness or the disease they tend to focus all of their attention on themselves, Herod said. “For Stephanie and I, I think it really brought the two of us closer together,” she said. “For me it was good to talk to Stephanie and understand what she was going through because it helped me relate better to my family and what they were going through. It’s been more than a year since Herod and Grajeda were diagnosed, and last week they both went in for their respective “preventative maintenance” checkups. The reports were positive on both fronts. “I think Tony would agree with me that we’re both very blessed,” Herod said. “We have good coworkers, good family and good friends.